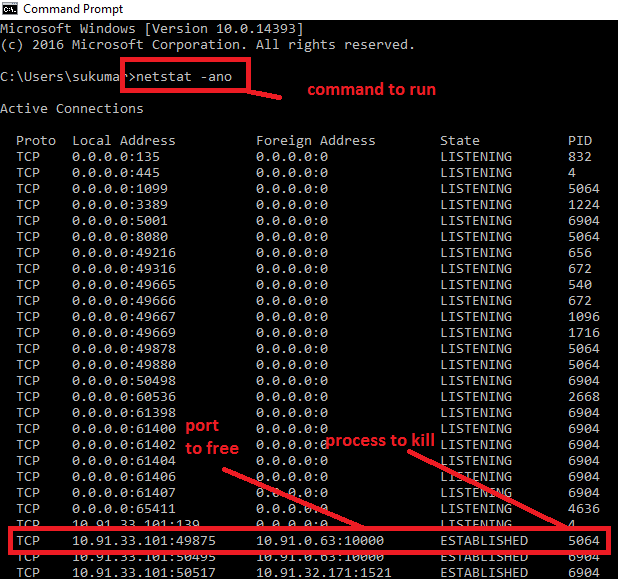 “netstat” command is used to check which program is using which port. Here are steps to forcefully free used ports. 1) Search cmd and run it as Admin Mode by choosing “Run as administrator” on right click. This will provide a list of ports, along with the PID (process ID) that has those ports open. 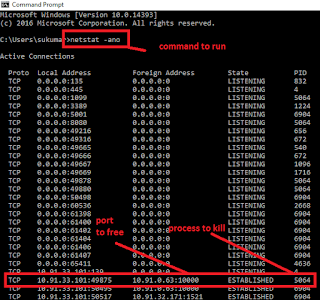 1) Open a Command Prompt window as an administrator. 3) Type list disk, to determine the disk number .The list disk command displays all the disks on the computer. Note the drive number or drive letter of the USB flash drive. 4) Type select disk <X>, where X is the drive number or drive letter of the USB flash drive, and then click ENTER. 5) Type clean, and the click ENTER. This command deletes all data from the USB flash drive. 6) To create a new primary partition on the USB flash drive, type create part pri, and then click ENTER. 7) To select the partition that you just created, type select part 1, and then click ENTER. 8) Type format fs=ntfs quick to format the disk. To format the partition as FAT32, type format fs=fat32 quick. 9) Type active, and then click ENTER. 10 ) Type exit, to exist from cmd. 11) Now save your custom image to the root of the USB flash drive. 3) On right hand side just right click on Processor name string and modify it with any name. 4) Now check it in My Computer properties . 1) Open Regional and Language Options window by pressing Windows + R and type intl.cpl . 2) Click on “Addition Settings” button.